The Nobel Prize for Literature at last has been awarded to the most important and most influential author of the post-World War II era. Bob Dylan is incomparable. No other writer, no other artist, remotely resembles him in the body of his work, its brilliance, its beauty, its inventiveness, its eternal consequence. Dylan was born in 1943. Since that year the Nobel Committee has selected several luminous (and many puzzling) laureates. Andre Gide. T.S. Eliot. William Faulkner. Ernest Hemingway. Boris Pasternak. Jean-Paul Sartre. Samuel Beckett. Saul Bellow. Isaac Bashevis Singer. William Golding. Momentous writers, all. Yet none has exercised anything like Dylan’s transformative impact upon the world’s moral and imaginative consciousness. The wisdom, mastery, wit, and grace of Bob Dylan’s literature so pervade our minds and our emotions that they seem elements of actuality, not one man’s compositions but fundaments of existence like air, water, earth, fire. Conditions of our lives, not one person’s creations. Every day, like many of us, I call to consciousness many of Dylan’s works. Always his art fills me with enlightenment, wonder, reverence, and gratitude. Also, for many weeks now, for months, I’ve been replaying and ruminating about the gorgeous cover albums: Good As I Been To You, World Gone Wrong Fallen Angels, Shadows In The Night. As well as, fortuitously, Ring Them Bells – an apt title for the rapturous worldwide reaction the Nobel award has inspired. The dreadful global news cycle of 2016 will do that to you. She’s an interesting cat, my friend’s mom. I wonder which ones the Chief Justice of the United States is studying today? 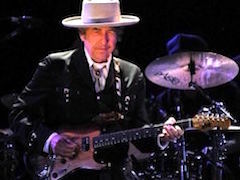 And am smiling to think of Justice Scalia’s ardor for many of Dylan’s most subversive songs. Bob’s scythe cuts a wide swath. Which of Dylan’s records matter the most to you? Do you, like me, find yourself recurrently reading Chronicles: Volume One, thumbing through that fascinating, gentle, kind, stunningly intelligent book over and over again, even though you remember the text very well? There is nothing static or finished about Dylan’s art. This is one of the reasons we listen repeatedly to his songs, re-read his interviews, reconnect with his book, stare and stare at his spare, haunting canvases, his stark, striking, primordial sculptures. I think his art keeps calling us back and affects us in ever-new ways because it is in the broadest sense dynamic: sensate, in motion, ceaselessly evolving. Bob stands in the same relation to his work as we do. Particularly his music. He, too, experiences his musical literature as alive, protean, inherently metamorphosing, deserving incessant re-experience and recreation. I can think of no other artist who has worked so long, so hard, so bravely to constantly revisit, renew, and rebirth his compositions. Dylan’s foremost artistic commitment, his performance art, the celebrated Never Ending Tour – a term he derides, and for which he prefers to substitute “my trade” – constitutes an unparalleled experiment in infinite incompleteness, permanent reimagining, perpetual renascence. Can you name any other artists who so love to ply their trade? Who so thoroughly entrust themselves to challenge and change? Who so unremittingly and unorthodoxly offer themselves to continuous creation? Absolute aliveness. He will not be defined. He will not be typed. He will not serve. His greatest teaching is the way in which he lives his intricate, inscrutable, utterly extraordinary existence. Bob Dylan incarnates genius. In his work and in his daily life he valiantly imparts the necessity of the uncodified and the crucial gestative power of originality. The rare, precious, and radically threatened qualities that most powerfully summon our humanity and animate our civilizations. Every society imposes enormous pressures upon its citizens to conform to prevailing prototypes of ideation, feeling, appearance, and behavior. No doubt conventions are essential to social order, stability, harmony, and human contentment. But excesses of stereotypy invariably produce sterility, stagnation, corrosion, and decay. No other force so muscularly defends the human spirit from its civic confinement than imaginative inquiry. Creative art is even more crucial than science and technology to our capacity for critical thought, our pursuit of discovery, progress, and, ultimately, pleasure. In the modernist culture no other artistic medium so proactively and potently protects our vital work of restlessness and invention as populist music. This is why despots dread and strive to suppress its makers, abhor and attempt to restrict its performances. Their paranoia is rational. Elvis Presley exploded entropy. Michael Jackson massacred monotony. Madonna made a mess of correctness and courtesy. Even posthumously, Jimi Hendrix detonates regimen and regularity. Bob Dylan does not swivel his anatomy, moonwalk, fool around with gender identifications, shatter protocols. He does make us think. He makes us “see what everybody in the world is up against.” He causes us to meditate about the unobvious. He invites us to consort with the unknowable. He summons us to leaven the quotidian with the invisible, the cosmic, and possibly the divine. And always, always, always he conducts his marvelous alchemies with exquisite cogency, cunning, and craft. He is generous, too. He could just look after himself and his loved ones, if he wanted to. But at age 75 he keeps on giving us his Never Ending Gift of fierce sedition, supernal acumen, and sly, wry, fall-on-the-floor fun. Amidst the horror of warfare, the rancidness of racism, the insanity of intolerance, the iniquity of misogyny, the malignancy of malfeasance, the miasma of money, the madness of might, the disease of too many political systems and the disorder of too many institutions in every nation’s homeland, how wonderful that we get to journey Together Through Life – the title of one of Dylan’s most enchanting albums – with this wonderful bard, troubadour, thinker, disrupter, magician. Our civilization’s laureate of literature never has sought and does not need acclaim or award. Let us nevertheless give thanks to the Nobel Committee of the Royal Swedish Academy of Sciences and the Norwegian Nobel Committee for reminding us what most matters in our experience, and what most will endure. Not grotesque news cycles, sad perfidies, momentary sins, and temporal banalities but the sublime majesty of beauty, thought, and creation. Let us Ring Them Bells for Bob. We never will meet him. We never will speak with him. No need. He converses with all of us anytime, all the time, mind to mind, heart to heart, soul to soul. Thank you, Mahatma Dylan. May you be in happiness and peace. Neuroscientific research recently has revealed the synapses that determine our aesthetic appreciation are located in the same core of the brain that houses our primal Survival instinctions. This suggests our species has learned to regard our instinct to be educated and our ability to pleased as coessential with our most foundational existential constructs. Some people, not many, none persuasively, have questioned whether the Nobel Prize committees of Sweden and Norway ought to have “expanded” the traditional definition of literature. Of course they should have. In an unusual moment of concordance with dictators and other tyrannizers, the committees are recognizing that for many decades populist music has operated as the world’s most significant form of contemporary lexical composition. Cinema is populist music’s nearest compeer. One day soon the Nobel committees may confer a literature award upon a major artist of film. I nominate Francis Ford Coppola as the pioneer laureate.